Ryan D: When one writes about comic books, due to the popular types of stories being told, the critical eye encounters Joseph Campbell’s template for “the hero’s journey.” This monomyth pervades the pages of superhero titles, and seems even more prevalent in solo runs of characters due to the ease of accessibility inherent to that narrative. 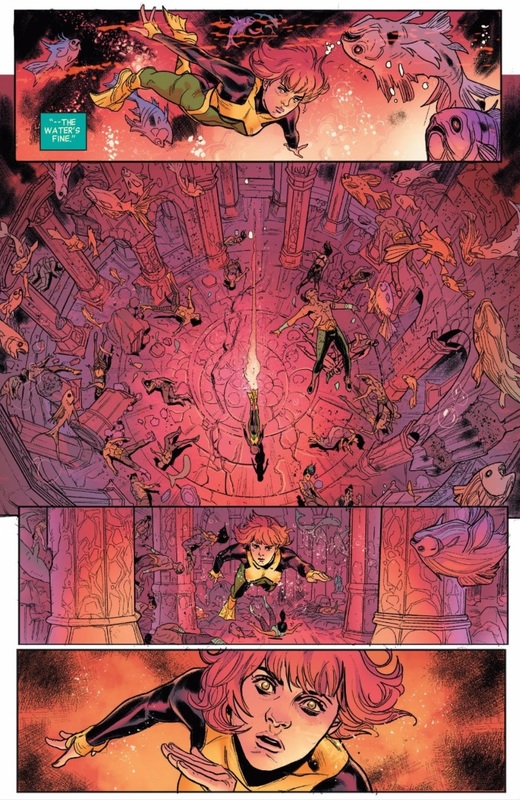 In Jean Grey, however, Dennis Hopeless and his creative team use a different kind of literary precedent — that of the Bildungsroman –– to tell the story of the young Jean as she gears up to meet the looming threat of the Phoenix. The Bildungsroman is a novel of formation or education with the psychological and moral development of the protagonist as the crux of the narrative, along the lines of Ponyboy in The Outsiders or Marji in Persopolis. 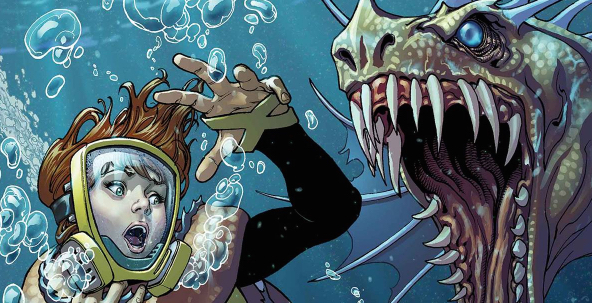 Jean Grey 3 continues that trend of Jean moving painfully towards development and maturity as she learns a lesson in the company of “Marvel’s First Mutant,” Namor. Seeing all of the sharks and oceanic predators and prey fleeing the kraken in one swift exodus sold the threat of the monster, and makes for a pretty powerful image. Fighting this creature also gives credence to the rule in drama or screenwriting (which I may be making up but I’m pretty sure it’s a thing) to “give them something to do,” i.e. if you have a scene of talking but need to spice it up, have the conversation happen while the two participants chop up a dead body, or rob a bank, or play an arcade game and it’s infinitely more interesting. Also, while Namor features in other current Marvel titles, seeing him in action gives the audience plenty of characterization without needing Jean to tell us in her thought-conveying caption boxes. As aloof and stoic Namor seems, his mind takes the shape of an Atlantean antechamber and throne room strewn with the bodies of countless dead innocents. I love how the royal quality of purple here comes across as wan and impotent against the jarring yellows and oranges of the Phoenix Force, which carries a heat which water cannot temper. 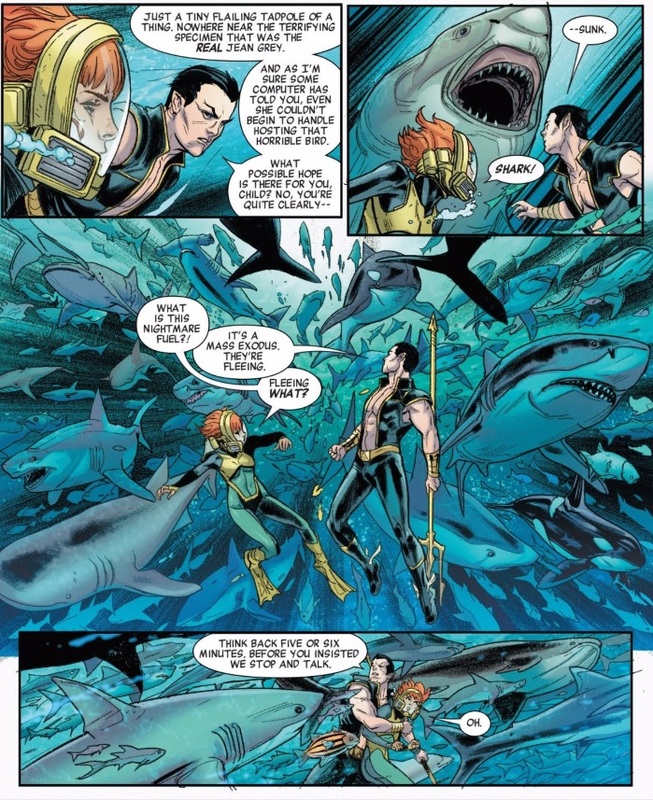 Colorists Jay David Ramos and Dono Sánchez-Almara use this swap in color palette from cool blues and greens very effectively to offer variety for the readers’ eyes while also highlighting the significance of this trip into the Sub-Mariner’s subconscious for the answers which brought Jean underwater in the first place. Artist Victor Ibáñez also keeps the focus and path of Jean’s journey on this page centered right down the middle of the page, highlighting her as the focus of these panels while offering plenty of architectural geometry and ancillary detail around her until the last panel of the page when the background disappears and the camera zooms in to register Jean’s surprise and shock. I love when pages end this way and utilize a comic’s best device for creating a sense of suspense: the page turn. Ibáñez rewards this page turn with a visually striking page showcasing the rage of both the Phoenix Force and Namor, both of whom dwarf Jean across opposing diagonals of the page. 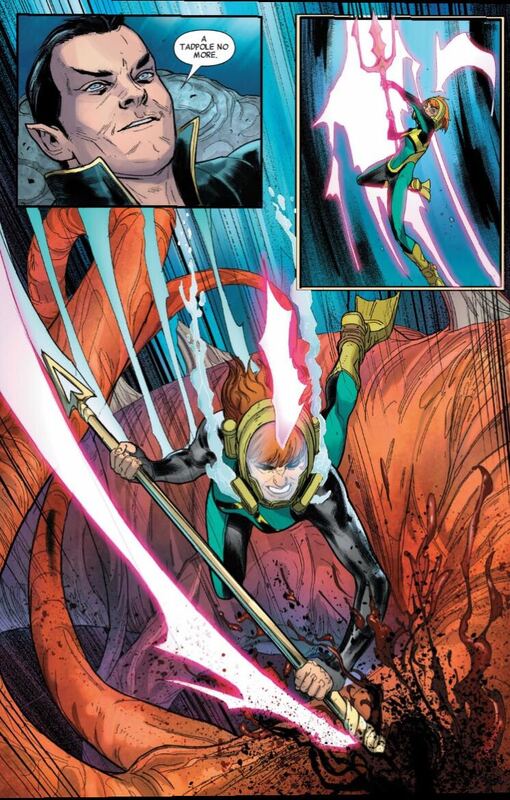 Of course, Jean goes on to find her fighting spirit and slay the kraken on her own by the end of the issue, opening up the possibility in the next issue for her to be “a warrior in training” and learn and fail and grow further, exactly as a Bildungsroman should. This issue and the previous have allowed for Jean to be much a more proactive character than the first issue suggested, and her seeking Namor on his turf, by herself, in an uncomfortable and deadly environment, and killing a monster gives her a clear sense of agency which I find much more engaging and urgent than your standard “coming of age, finding my identity” fare. How about you, Ryan M? Anything you dug about the dynamics between Jean and Namor? Did this issue make you re-examine any of the “fate vs. self-determination” ideas floating through the series thus far? Ryan M: It sure did. This issue really underlined that if Jean’s goal is to break free of the Phoenix, that the answer doesn’t lie in the passive hope that maybe it’ll all work out. Jean is transitioning from trying to escape her fate to fighting it. Ryan, I’m so glad that you pointed out the differences between the traditional Hero’s Journey narrative and the internal arc at the center of Hopeless’ story. Jean’s struggle to deal with circumstances that she could not control is a universal factor of childhood. We cannot choose the lives that we are born to or the make the majority of the choices that determine our lives. The big lesson in these kind of tales is that growth means taking on the responsibility for your future. If Jean meets the Pheonix with her intention as survival rather than victory, she will be consumed. Hopeless makes this connection nearly explicit. Jean has come to Namor for his help and he ends up lying paralyzed as the kraken bears down on them. Their exchange illustrates her first instinct in a crisis. She wants to hide, to stay safe from the looming danger rather than force any confrontation. Namor immediately mocks her for this attitude. Hopeless allows the reader to see exactly what holds Jean back by pairing her with a character who will never pull a punch. He even gets in a barb about the two of them living “happily ever after,” reducing her earlier saucy thoughts to schoolgirl fantasies. Ibanez uses their physical positioning to reinforce the imbalance of the moment. In the center three panels above, Jean is caught off-guard, her body twisted. Next, she is pouting like a child with her arms crossed and her face turned away, as if looking a different direction can turn off her ears. Finally, the art is ceded entirely to Namor. He sits on the rock, unable to move, but his experience and self-possession make him the alpha. He exercises that dominance throughout the issue from the moment he appears to save and insult Jean. His attitude conveys a security in his life and a confidence that the world is free of the kind of fear that plagues Jean. He even faces death with a sense of calm. 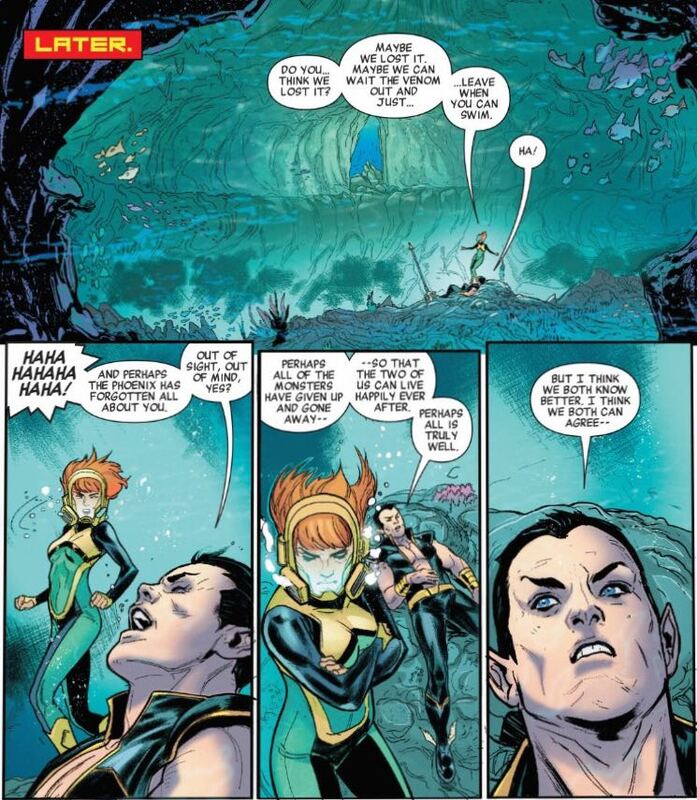 While Jean is literally searching, Namor has found the answers he needs. Ultimately, Namor’s lack of empathy is exactly what Jean needed to find her path. When Jean takes control in this issue, we don’t need any words to convey her immense power. Ibáñez gives us a fierce Jean diving forward, weapon in hand. It’s an exciting place to end this issue. Jean’s goal has now become stronger and all the more compelling for it. I think the idea of give them something to do is a bit more complicated than just ‘have them fight a monster’. It is important not to just have static talking heads, but I also think the superhero cliche of having the conversation during a battle is actually a crutch holding things back at times. Which isn’t to say that having the conversation while chopping up a dead body, or robbing a bank, or playing an arcade game is a bad idea. But it has to be used right. Provide additional meaning to the conversation. Chopping up a body to emphasize the banality of the character’s evil, robbing a bank to show either their greed or, through the contrast to the high stakes situation, their immaturity. But you can’t let the action get in the way of the key idea, the dialogue. It should add meaning and deepen the conversation by its presence, and the needs to depict that action dynamically and in interesting ways shouldn’t distract from the more important need to make sure the dialogue itself it depicted dynamically and in interesting ways. Which is why the ‘important conversation during a fight’ often feels like a crutch – too much effort is placed on depicting how the characters fight, and not how they talk. There is a reason it is hard to think of a superhero conversation during a fight that matches the scenes I discussed above.